When tummy trouble has you staying home diagnosis is not always easy. Aside from the simple upset stomach and abdominal pain caused by influenza and other viruses there are numerous medical disorders that could be causing your stomach symptoms. Below is a brief list in alphabetical order, of the most common digestive disorders. Barrett's oesophagus is a digestive disorder that affects the lining of the oesophagus. This disorder results from the continuous presence of stomach acid in the oesophagus, usually as a result of gastroesophageal reflux disease. If the oesophagus lining becomes too damaged, the condition can eventually lead to cancer. Celiac disease is a condition that is caused by the inability to digest gluten, most commonly wheat gluten, in the intestines. Individuals with this disorder cannot consume any foods that contain gluten without experiencing stomach pain and diarrhoea. Crohn's disease is a type of inflammatory bowel disease. The symptoms of this disorder include stomach pain, cramps, diarrhoea, and sometimes the appearance of blood in the stool. Ulcers that form any where along the gastrointestinal tract cause these symptoms. Diverticular disease is characterised by the formation of little pouches in the wall, or lining, of the large intestine. The three main subcategories of this disorder are Diverticulosis, Diverticulitis, and Diverticular Bleeding. The symptoms of this disorder include abdominal pain, nausea, vomiting, constipation, and sometimes rectal bleeding. An E. coli infection is the result of contamination from bacteria that results in severe diarrhoea and abdominal cramping. The disorder, which is usually more serious in children and the elderly, can also result in bloody diarrhoea. The gallbladder is an internal organ that stores digestive juices that aid in the breakdown of consumed foods. These juices, which are produced by the liver, can sometimes solidify in the gallbladder. The resulting hardened masses are called gallstones, which can block the gallbladder and cause abdominal pain and cramping. Giardiasis disorder results in abdominal cramping, diarrhoea, and excess gas, which are caused by the presence of microscopic parasites in the bowel. Heartburn is a digestive disorder that occurs after an individual has eaten a large meal or a meal containing an acid food. Heartburn is characterised by a burning feeling in the chest that worsens upon lying down. The burning sensation can also be accompanied by a sour taste in the mouth. This disorder is usually not serious and will usually clear up within a few hours of the meal. Inflammatory Bowel Disease is the medical name for a group of digestive disorders that cause inflammation of the intestines. The two most common forms of this disease are colitis and Crohn's disease. The symptoms of this disorder include abdominal pain, stomach cramps, and diarrhoea. 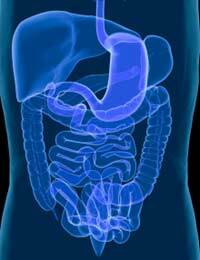 As the condition worsens some individuals may also experience intestinal bleeding and weight loss. Irritable Bowel Syndrome, IBS, is a disorder that also affects the intestines. This condition is characterised by abnormal intestine contractions. If the intestines contract too weakly food is moved too slowly through the digestive process resulting in constipation, abdominal pain, and cramping. On the other hand, if the intestines contract too hard the food is moved too quickly through the digestive process resulting in diarrhoea. Stomach cancer, also refereed to as gastric cancer, is the result of abnormal tissue growth in the lining of the stomach. When these cells grow too quickly or mutate from the normal growth pattern they can clump together and cause tumours to appear. If the tumours are cancerous they can attack the healthy tissues in the stomach and eventually begin attacking tissue in other parts of the body. Ulcers are a digestive disorder characterised by the appearance of sores in the lining of the intestines, stomach, or oesophagus. These sores can be caused by increased acid in the digestive tract and can also be a symptom of some other digestive disorders. The symptoms of an ulcer include abdominal pain and a burning sensation in the stomach. If you experience any type of stomach pain that does not clear up within seven days, or that comes and goes over a twelve week period you may be suffering form some type of digestive disorder. If you experience any symptoms related to a digestive disorder you need to make an appointment with your doctor for further evaluation and care.